Carmen Velásquez is the founder of Alivio Medical Center and the immediate past Executive Director. In the mid-1980s, she was very passionate and involved with issues surrounding barriers to healthcare. Troubled by the fact that the medical needs of so many Mexicans living in Pilsen, Little Village and Back of the Yards were being severely neglected, she garnered the support of fellow Latino community members and spearheaded a drive called Project Alivio. Ms.Velásquez and Dr. Ann Garcelon, a colleague of Ms.Velásquez and former Alivio board member, approached Mercy Hospital’s CEO, Sister Sheila Lyne. When Sister Sheila supported the creation of a community health center to address the issues of access to health care, the work of Alivio Medical Center was initiated. 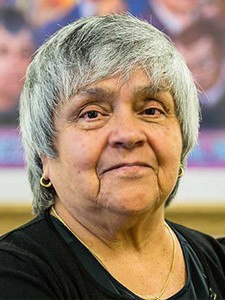 In 1988, Ms.Velásquez was hired as Alivio’s first Executive Director. Soon after, while walking through Pilsen in search of clinic space, she saw a muffler shop parking lot bursting with trucks. When Ms.Velasquez went in and asked the owner if the lot was for sale, he said, “Offer me something.” So she did and offered the owner an amount which Project Alivio did not yet even have. That day, they launched a campaign to raise $2.1 million for the lot, the construction of the clinic and all necessary equipment. This site became the home of Alivio’s very first clinic.